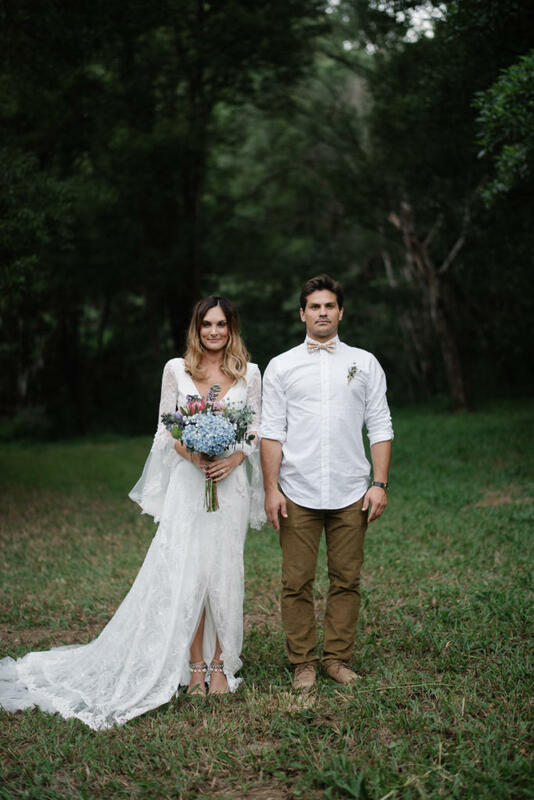 I had the pleasure of styling a wedding for two of our nearest friends SARA + LEVI CORBY. Sara and I worked together at the AFL and from day one we became so close, so when she asked me to style her wedding day, I was so blown away. Sara was incredibly kind and let me have full creative control on the day - so a lot of the styling was just as much a surprise for her on the day as it was for the guests. The wedding was a dream and to see two people so madly in love, makes for a day filled with a million happy tears and so much joy. You need to start by watching the wedding video here + then head back for all the details below. Images in the post are a mix from The Rare Negatives and also stills from the Roost film. FLOWERS | Peppa Hart and Helen Foukkare made the bouquets, fern crowns and boutonnières. Levi and I were hosting Christmas in 2012. After a fun-filled day of opening (too many) presents and playing backyard cricket, all 20 of us sat down to eat dinner on long tables we’d set up on our back deck. Levi had made one of those tables specifically for the event (little did I know) in order to build a secret concealed space beneath where he’d sit. We’d all made our toasts, but just before dessert, Levi got up to make a final one. I remember thinking to myself, “sit down Levi, enough for today!” when he pulled out a piece of paper from his little hidey-hole and started to read a light-hearted poem he’d written… it took a moment for me to register what was going on, and when I looked around the table and saw everyone with tears in their eyes, I knew it was serious! There was no ‘drop knee’, but as the poem came to an end, he pulled out the ring from the same place and asked me to be his wife! One of the best moments of my life. Our engagement ended up lasting just over two years. We had started planning the wedding in early 2013 when, in April, I found out I had fallen pregnant with Clover. As excited as I was, I remember thinking “this isn’t the order it’s meant to happen in… first marriage, THEN the baby!” But now, I wouldn’t have it any other way. To have had her there as Levi and I said “I do”, was so incredibly special and we couldn’t be more grateful for how things worked out. Inspiration: It was really important to both Levi and I that our wedding be relaxed, comfortable, super-fun but still romantic and intimate. 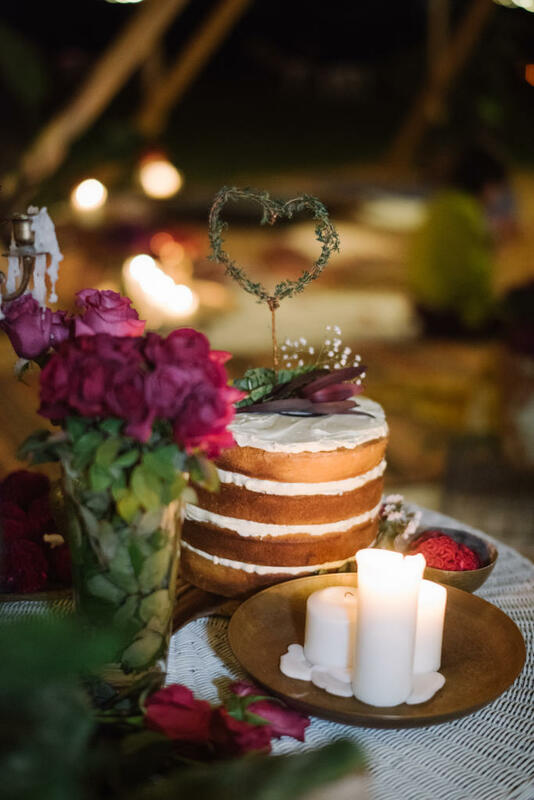 I guess our theme would have been boho-chic, but it was more about bringing-in things that we loved and that our guests would enjoy and appreciate. 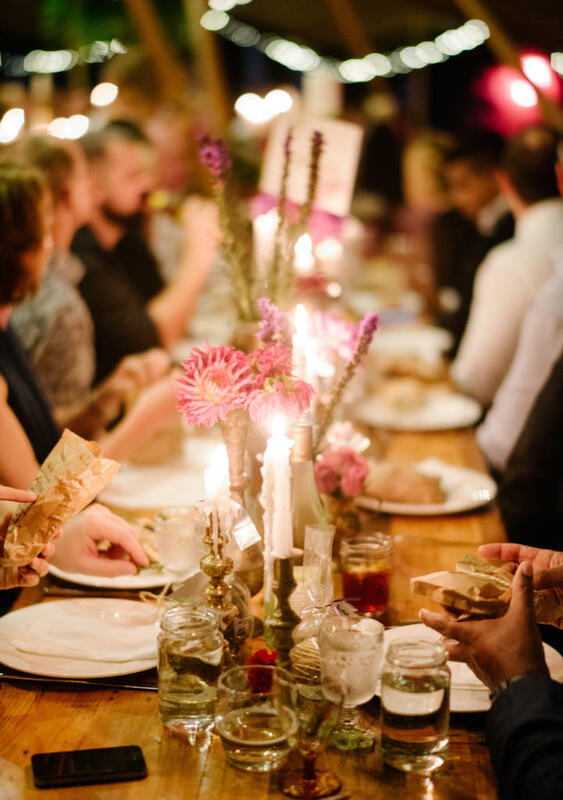 We had beer on ice as guests arrived; live musicians, giant games, beautiful big tipis where guests sat underneath on long tables to enjoy a ‘feasting’ style menu. For us, it was all about good food, good drinks and good music and good FUN! 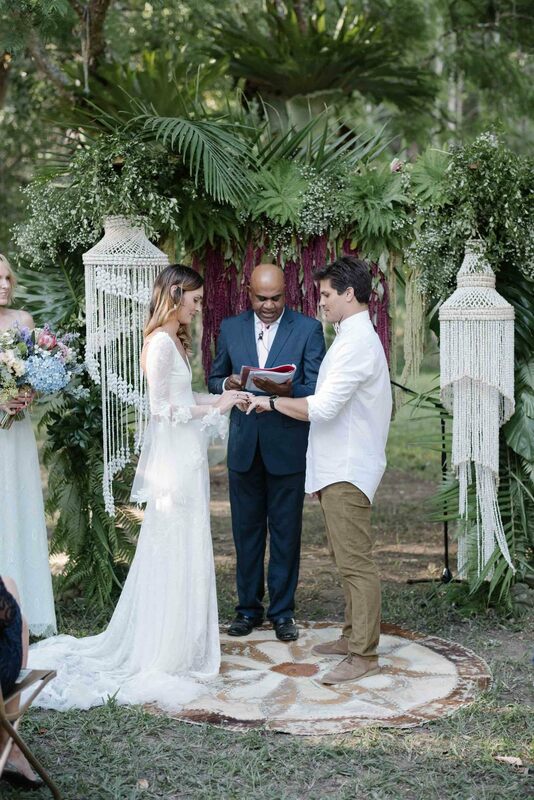 I planned a lot of it myself, but I had on-the-day-coordination help from ‘The Events Lounge’ and wedding styled by Sophie Bell from Peppa Hart. A standout from the entire wedding was the triple-tipi setup and lighting by the amazing team at TipiLuxe – WOW. 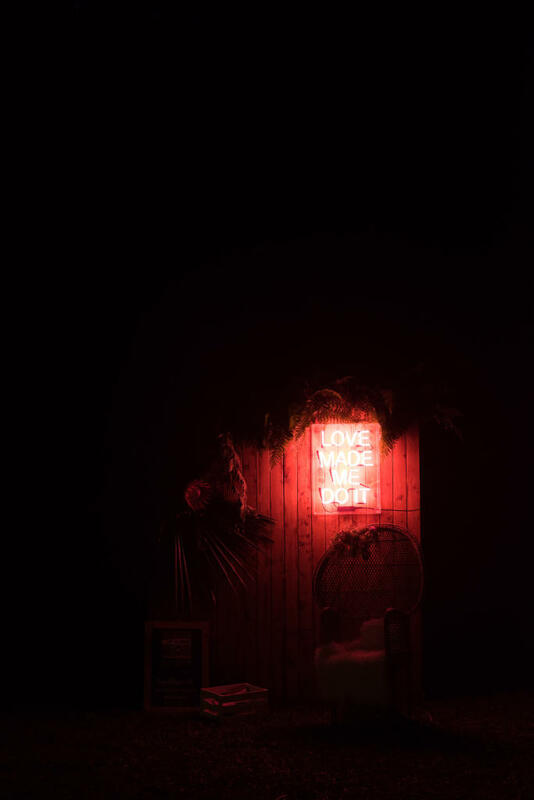 The time and effort that they put into installing these big, beautiful structures as well as the meticulous placement of the festoon and fairy lights by Emma Bell to create the right ambience and achieve an elegant glow, certainly didn’t go unnoticed. Other favourite details included our double-arches and foliage chandeliers created by my dear friend and insanely talented, Sophie Bell from Peppa Hart. The thought and love that went into these pieces was awe- inspiring and the results, simply stunning. To see the LOVE-NEST that she created underneath the tipis – from the foliage chandeliers, the beautiful fresh flowers, the lush rugs and furs, to the brassware and floor trays dripping in hundred of candles – was beyond anything I could ever imagine. And lastly, all of the pretty little details by my bestie, Helen Foukkare. I couldn’t have done it without her – all of the love, energy, effort and time will never be forgotten. I have so many, but there were two standouts. One was when I reached the end of the aisle and saw my husband-to-be, the look in his eyes and my darling little daughter in his arms. In that moment I knew that everything was as it should be. And the second was our first-dance. Over a year earlier, Levi introduced me to the sound of an incredibly talented musician called Julia Jacklin. He had heard her song ‘Santafel’ on Triple J Unearthed and played it to me. As soon as I heard her voice, I felt compelled to contact her and see if she would be interested in playing at our wedding. I didn’t get my hopes up as I knew it would be a long- shot, but a few days later I heard back from her saying she’d love to! Julia and her friend Elizabeth Hughes created magic amongst the trees at Shamba Malaika. And Julia’s rendition of Julia Stone’s “Wedding Song” for our first-dance was a moment in time I’ll never forget. It felt like Levi and I were the only two people in the room, twirling to the sound of that beautiful voice we’d fallen in love with all that time ago (until Levi grabbed my bum in front of our 125 odd guests!). Breathe! And I highly recommend hiring an on-the-day-wedding-coordinator! I wasn’t planning on doing this, but after some sound advice from a friend, I thought I should look into it – and I’m so thankful I did! Rachael and Annique from ‘The Events Lounge’ were fantastic to work with, incredibly thorough and organised. There was no detail too big or task too small. Having them there on the day certainly provided that ‘peace of mind’ every Bride needs on the day of her wedding. I’m not sure how funny this is, but it’s worth noting.. One week prior to the wedding, Levi fell victim to salmonella poisoning. (According to Levi) I wasn’t blessed with much of a compassionate streak, so I was convinced it was just nerves and refused to acknowledge his timely sickness just as I needed the most amount of help leading up to our wedding day. It wasn’t until our wedding night, just before we were invited to get up and cut the cake, that he turned to me and said “if I don’t leave right now, our guests are going to witness something they don’t ever want to see!” Understandably, the cake-cutting was delayed a few minutes while Levi found the closest tree to barf behind! Poor thing didn’t even get to eat his dinner. My dress, oh my dress! As a lover of all things lace, there was no question where I going to get my dress from. One of my dear friends, Megan, happens to be the owner of ‘Grace Loves Lace’ – who had a new dress custom-made for my special day. Luckiest girl in the world! For me, the process was fairly simple: I had a design meeting with Megs and her team, my measurements taken, and they took it from there. When I first saw my dress, I was a blubbering mess! I was completely lost for words. They had made a dream of mine, become a reality. When it came time to trying it on, I didn’t want to take it off! I was so honoured to wear it on my wedding day, and will be eternally grateful. It’s now called the “Francis” dress. I also had a reception dress. After our first dance, I snuck away and changed into the ‘Francesca’ dress by Grace Loves Lace – one of my favourites from their collection. The colour, fabric and fit were perfect and it was so much fun to wear and dance in! I also wore the Grace Loves Lace Dosa heel, the Salita Matthews for Grace Loves Lace Hera anklet and the Maya earrings!